If you've ever clicked through the PORTFOLIO link on my main page, you've seen my agent's site Shannon Associates. You've probably also noticed that the images in that portfolio have not been updated for...quite a while. For the past few years, I've been so busy creating graphic novels, that I've neglected my work portfolio. I wish the graphic novels paid all of my bills--they don't. In fact, most years, at least half (sometimes more) of my income comes from illustration only--not projects I've written. Book covers, interior art for chapter books, textbooks, products--you name it. Unfortunately, my illustration work has been a bit dry lately, due in large part to my non-up-to-date portfolio. So I'm creating some new pieces--custom pieces--for my portfolio. 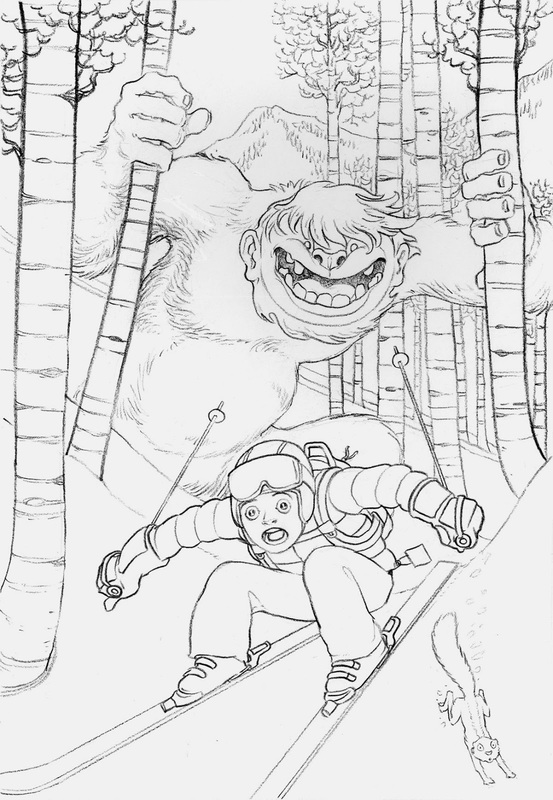 Here is step one of an illustration of a Yeti chasing a skiing kid. These are two things I've never done an illustration of: a skier and a Yeti. This is black Prismacolor pencil. I'm trying some new techniques--the next step will be some watercolor washes. That'll be up tomorrow. Nice! These lines look great.